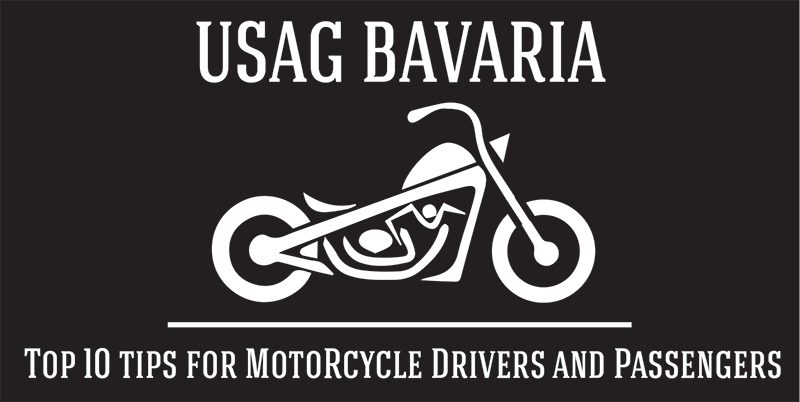 All active duty service members must take the Motorcycle Safety Foundation Basic Riders course before driving a motorcycle and subsequent Experienced Rider Course afterward. All active duty service members must wear the following gear regardless if riding on or off post, or on or off duty: Department of Transportation (DOT) approved motorcycle helmet, long-sleeved shirt or jacket, long trousers, over the ankle boots, full-fingered gloves or mittens made from leather or other abrasion-resistant material. Soldiers assigned to Army Europe units are also required to wear a vest, jacket, upper outer garment, or motorcycle clothing that incorporates fluorescent and highly reflective material at all times when operating or riding as a passenger on a motorcycle, on and off post, regardless of the local civilian requirements. The reflective policy also applies to DA civilian, Army contractor and family members (local nationals excluded) assigned to Army Europe units when operating or riding as a passenger on the installation and are highly encouraged to wear the reflective gear when off post as well. Jackets and pants constructed of abrasion resistant materials such as leather, KevlarR, or CorduraR and containing impact-absorbing padding are strongly encouraged. Note: Military uniforms, including Army physical fitness test wear that is designed to be reflective, do not meet the reflective material criterion stated above. Statistics show that the percentage of intoxicated motorcycle riders that are involved in accidents result in higher fatal crashes than the percentage of intoxicated drivers involved in accidents on our roads. This is why NHTSA urges all motorcycle riders to never drive a motor cycle while under the influence of alcohol or any other substance that will degrade ones driving ability. Remember: Ride smart and sober! Riding a motorcycle is a skill, and like all skills, it’s something that you need to develop. While you may be fine to go on an easy cruise around town, it takes time to grow the skills you need to be an expert rider. Driving different styles of bikes is another consideration. A cruising bike, for example, has much different handling characteristics than a sports bike. To stay safe, make sure that you always ride with the skill level and ability for the bike being driven. Distracted driving is a bad idea and can be much more disastrous for motorcyclists. A key to staying safe on a motorcycle is staying hyper-aware of everything that’s going on around you. A common mistake drivers and motorcycle riders make is not leaving enough stopping distance for bikes. While it’s true that bikes are smaller and lighter than cars and may need less space to stop and maneuver, ensure that plenty of space is given to the motorcyclist as the bike rider must do for the vehicle in front of them. Motorcycles don’t have the same level of stability as cars do. Riding a bike in the rain is much riskier than driving a car. With only two wheels and lighter, the motorcycle has half the traction than that of a car. Plus, without windshield wipers visibility is compromised or reduced. Make sure the passenger on the bike has the right gear. Like you, he or she should wear sturdy shoes and all protective clothing to include reflective wear. Practice riding with a passenger, especially if she’s bigger than the driver, in a safe place, like a parking lot. The driver can feel the difference in maneuvering with extra weight on the bike and the passenger used to how the bike feels, and how they need to move with the driver in various maneuvers. Ensure the passenger knows not to be a distraction. If the passenger is a young child, check the laws of your state or country. In some states, the child needs to be over a certain age to ride on the back of a motorcycle. Keep your eyes and ears open for motorcycles. Lots of bikes have loud exhaust systems specifically to draw drivers’ attention. But in Germany, too loud could mean a ticket. Look twice before changing lanes, and always check the blind spot twice. A bike may be there. Also, before pulling into traffic, look for motorcycles. For riders, look twice is still a good rule to follow and never assume that a driver sees you. Ride defensively and take responsibility for staying safe around cars. Oh did I mention wear a helmet (intentionally repeated). One of the most important pieces of equipment while on a motorcycle is a DOT approved helmet. Helmets protect the head which is the leading cause of death for motorcycle riders involved in accidents. The brain isn’t meant to be exposed to the type of trauma that occurs in motorcycle accidents. Of course, wearing something on the head isn’t enough, one must wear the right helmet. Novelty helmets may look cool but may not protect the head like those that are DOT approved helmets (Snell meets DOT standards). DOT or Snell certified helmets have been tested and will provide a minimum standard of protection.